Vinegar has become such a popular environmentally-friendly cleaning agent over the years, that companies have even started branding it as Cleaning Vinegar. Used by our mothers and grandmothers, vinegar is a low-cost solution perfect to be used throughout your home. Listed below are twenty ideas for using this versatile cleaner through any room of your home. As a way to save money on dishwasher tabs, yet still get sparkling clean dishes, I started making my own DIY Dishwasher Tabs using vinegar. In addition, I add vinegar to the bottom of the dishwasher to cut through cloudiness caused by hard water, and also keep the dishwasher itself nice and clean. Another great money-saving, kitchen solution using vinegar, is Homemade Cleaning Wipes by Nature’s Nurture. These are great for quickly wiping down surfaces, and throwing in the laundry when you’re done. (Note: Not for use on granite or stone countertops.) I use these to wipe off my kitchen table after meals, and to tidy-up before guests come over. If you don’t yet know the tip for cleaning your microwave with vinegar, you’re missing out. One Good Thing by Jillie has a great post on how to steam-clean your microwave in minutes. Seriously the easiest way to clean and shine your microwave that you will ever experience. Bren Did shows us how to get rid of garbage can smell naturally with a vinegar recipe. We’ve all been there, right? Looking for a way to clean your toilet that won’t leave your entire bathroom smelling like chemical cleaner? I created a Homemade Toilet Cleaner to easily zap through the grime, and leave your bathroom smelling lemony fresh. Coupon Closet brings us a super easy way to clean our showers daily, by making a cleaning wand filled with Homemade Shower Cleaner. This mix of vinegar and dishwashing detergent is a cost-effective way to cut down on cleaning time. When cleaning the shower, don’t forget to also clean the shower head since hard water often builds up there. The Melrose Family shows an easy tip for how to clean a shower head using a vinegar mixture, a Ziploc bag, and a hair tie. Thank Your Body has a great vinegar recipe for how to unclog your drain naturally. Being someone who loses a lot of hair, I will definitely be trying this in the future. Have mold or mildew on the walls in the bathroom around your bathtub, shower, or countertops? My Cleaning Solutions offers a great solution to get rid of mold or mildew on the walls with vinegar and baking soda. Practically Functional reminds us to also remember to wash the machine that washes our clothes. With a mixture of vinegar and bleach, and a sponge, you can easily clean your washing machine. Adding vinegar to your clothes not only brightens them, but also reduces static cling, and eliminates odors. eHow gives 11 ways to wash clothes in vinegar. We’ve all forgotten our clothes in the washing machine a time or two. Mom 4 Real offers a great solution for how to remove mildew smell from towels and clothes in the laundry using vinegar. Occasionally, even your iron gets dirty if you use spray starch or use it in craft projects to do iron-on transfers. Quilting Digest has a great tip on how to easily clean your iron with vinegar and baking soda. If you have small kids, or pets that sleep in bed with you, odds are you’ve dealt with mattress stains. Using vinegar, baking soda, and hydrogen peroxide, you can make mattresses white again. Cleaning Ideas tells how to clean stubborn stains out of a mattress. Window frames and sliding doors both have the window tracks that are tedious to clean, and very easy to forget about. The Intentional Mom shares a great recipe to clean window tracks like a pro. If you have pets, you know that vinegar drastically helps clean pet stains on the carpet. One Good Thing by Jillee gives helpful tips for application and getting rid of those stains quickly and easily. Make the cleaning pads you use on your wood, vinyl, or tile floors from home with Happy Money Saver. This project to make your own Swiffer Wet Pads will not only save you money, but allow you to throw the towels in the laundry and re-use them again. Maui Sea Love shares an easy tip for DIY Bamboo Floor cleaner with vinegar. I have bamboo floors, and often use this recipe, substituting different oils. 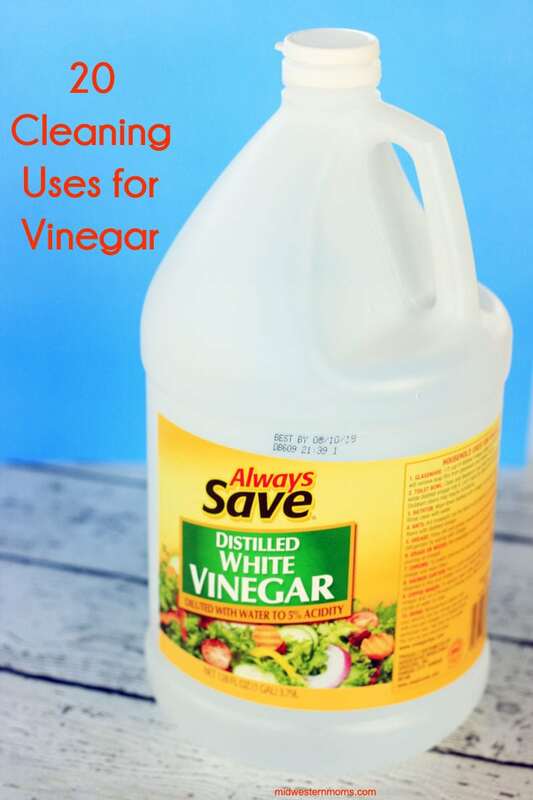 While we’ve given you several tips and ideas to clean with vinegar, there are also some important things to remember of what not to clean with vinegar. A Thrifty Mrs lists what not to clean with vinegar, reminding us that the acidity in it may actually harm certain materials. Do you clean with vinegar? We’d love to hear your experiences, or any tips and tricks you may have in the comments below.